The role natural forests and commercial plantations play in addressing climate change and promoting sustainable development continues to be a controversial, at times hotly debated, issue among policy makers, timber and construction industry players, environmental groups, and local communities. Mexico President Enrique Peña Nieto highlighted his government’s commitment to development of commercial forest areas in a speech reinforcing Mexico’s commitment to climate change mitigation and adaptation. “For many years, we maintained the paradigm, the model, the stereotype that it was unthinkable to exploit our forest areas when it is, in fact, possible,” the president said. Peña Nieto pointed to Canada and Finland as examples of countries where it has been shown that industrial forest plantations can be commercially successful while at the same time contribute to the achievement of national and international greenhouse gas emissions reductions goals and promoting sustainable development. 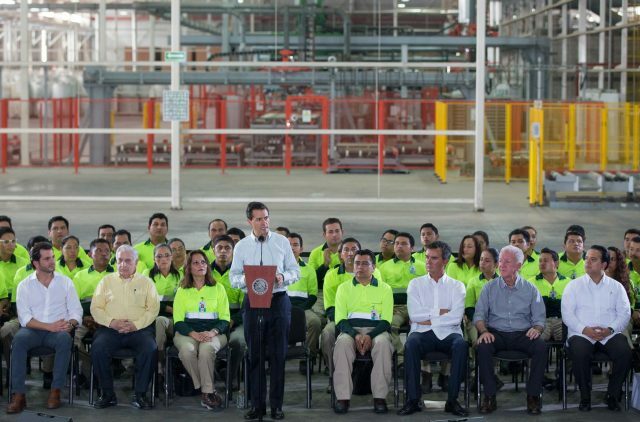 The president gave his speech September 23 for the inauguration of a $12 million medium density fiberboard production facility owned by Proteak Uno, Mexico’s largest commercial forestry company. 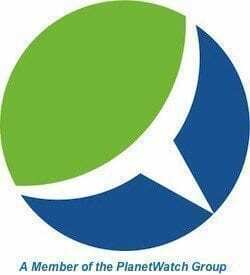 Located in Ulimanguillo in the southern state of Tabasco, the facility uses the latest technology, some from Finland, to produce as much as 280,000 cubic meters per year of medium density fiberboard. Mexico imports nearly all the wood board used for construction in the country. Proteak Uno is the first company to produce medium density fiberboard at large scale domestically. The lumber is sold under the brand name Technotabla. Finnish overseas development bank FinnFund invested $12 million in Proteak Uno’s project. 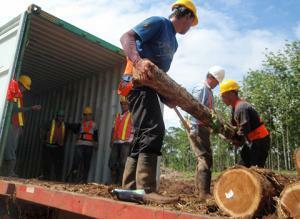 “MDF board made in Mexico is also an ecological choice,” Finnfund states in a news report. Others disagree, asserting that commercial forest plantations are wiping out grasslands, other types of ecosystems and even prompting deforestation, not to mention disrupting and uprooting native communities for the benefit of large timber corporations and international investment groups. Thousands took to the streets of Durban, South Africa last year during the World Forestry Congress in protest of the way the UN Food and Agriculture Organization (FAO) defines forests. Having received a petition of protest with more than 100,000 signatures, the FAO responded to organizers by downplaying the impact and importance of the definition. Though it may initially appear to be a minor, insignificant issue, environmental NGOs, such as Plantnet, Salva La Selva, Timberwatch and World Rainforest Movement, explain the far-reaching, negative ramifications of what they assert is the FAO’s overly simplified, “one size fits all” definition of what constitutes a forest. 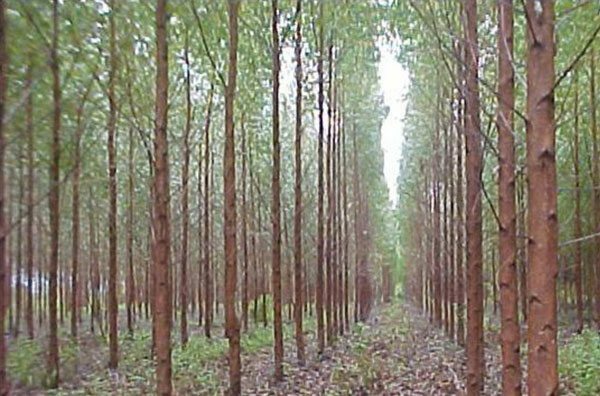 As they explain, the FAO defines a forest in perhaps the simplest terms as any area of land within with resides a certain density of trees. That means that commercial tree plantations, which often consist entirely of non-native eucalyptus trees inhospitable to indigenous flora and fauna and consume lots of water, are counted as forests by the FAO and flagship UN environmental governance agreements, such as REDD, the Convention on Biological Diversity, the UN Framework Convention on Climate Change (UNFCCC) and its new strategic agenda, the Sustainable Development Goals (SDGs). Continuing to organize local and international support and lobby the FAO to change its definition of forests, the environmental NGOs declared September 21 the International Day of Struggle Against Tree Plantations. They also sent the open letter to the FAO. “Through this Open Letter, we assert that the FAO forest definition is responsible for many problems in respect of forest loss, land degradation and associated harmful impacts on forest and grassland dependent local communities.